I heard that Backyard Cinema were showing one of the all-time classics (The Goonies) on August Bank Holiday weekend. Who would miss the opportunity to see that on the big screen?? So I grabbed my bestie, and we had a well-needed break from our houses and the kids that dwell inside them! 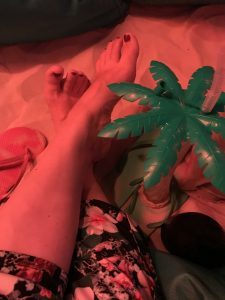 Off to London we went, and after a stroll along the river, taking in the sights that South Bank has to offer (and a quick stop off for a totally-to-die-for ice cream) we made it to Mercato Metropolitano and the home of Backyard Cinema. 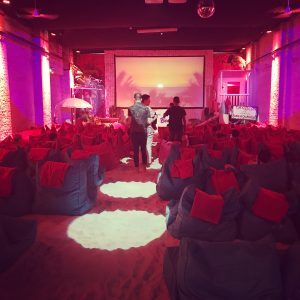 Backyard Cinema is a cinema like no other; from humble beginnings in founder Dominic’s very own back garden, Backyard Cinema has grown to be one of London’s most recognised and sought after alternative cinema experiences. 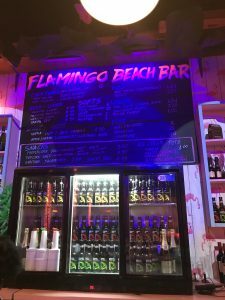 It’s a fully immersive experience – the current theme is Miami Beach. It’s great for an evening out with a twist. The films on offer include blockbusters, new releases, cult classics and family favourites. Something for everyone! After collecting our tickets, we made our way inside. You get straight into the swing of things really quickly, as you swap your regular shoes for flip flops. We opened the door to the cinema and wow! Warm and cosy, and feeling sand underfoot. We got there nice and early so we could soak up the atmosphere of being at the beach! 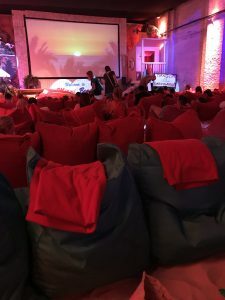 Oh my Gosh – your seats are BEANBAGS! None of those hard cinema seats for us, oh no. You literally just fall into a beanbag chair and just don’t want to get up. That is until you remember that you want a drink from the bar! You get a great view of the screen as everyone is low down in the beanbags. No big heads getting in the way! Backyard Cinema really go for it with the 1980s Miami Beach vibe, and they had some cracking music playing over the speakers before the main event for us all to enjoy! And the trailer before the film came on was epic – clips of all of your favourite 80s programmes, which was guaranteed to whisk you straight back to your childhood! Oh yes, we had to treat ourselves to cocktails from the beach bar. There is a whole host of treat available; beers, wine, bubbles (soft drinks too). 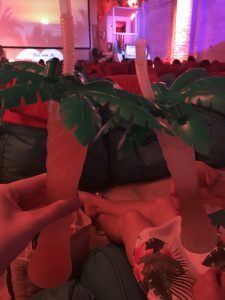 And of course, no beach bar would be without the cocktails! 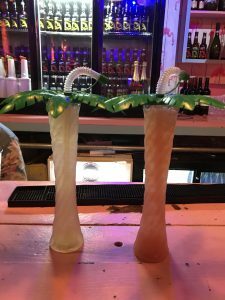 A Pina Colada and Miami Mai Tai were swiftly purchased. These little beauties were deceptively strong! There’s also a great selection of snacks, including gourmet popcorn. 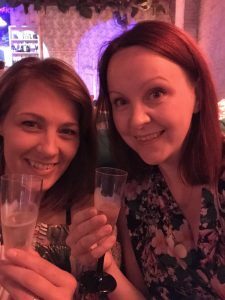 We certainly got a taste for the booze, and a bottle of Prosecco was purchased just before the film started for us to enjoy. Perfect! The Goonies is an 80s classic, I think you’ll agree! To see such an iconic film on the big screen for the first time was a real treat. Hearing the ripples of laughter at some of Chunks classic one-liners was awesome. There’s a huge emphasis on fun at Backyard Cinema; they want you to have fun. Selfies are positively encouraged (although you are reminded to switch your phone to silent for the film… it’s only proper etiquette!) I don’t think I could go back to a “normal” cinema experience again! Backyard Cinema definitely has a new devotee! We had a lovely time at Miami Beach… can’t wait to see what Christmas has in store! !